For the most part, we’ll be running with the same approach that Jonah Keri used for baseball. But hockey’s salary landscape has a few unique quirks, so let’s lay out some ground rules. • The NHL assigns a cap hit by averaging a player’s total salary (including bonuses) across the entire contract, and that value never changes during the life of the deal. That’s really the number we’re interested in here, even if the actual salary rises and falls over the course of the contract. I noted a few cases where the structure was especially creative, but we’re focusing on the cap hit, not actual dollars spent. • The length of the contract matters, and in many cases is a bigger factor than the cap hit. Contracts that expire within the next year or two had to be really bad to even enter the discussion. Dany Heatley’s $45 million deal turned out to be a disaster for several teams over the years, but it expires at the end of this season, so it’s not really a bad deal today. • It won’t surprise you to see that several of the controversial “cap circumvention” deals from years past show up below. Remember, the new cap recapture rule makes those contracts especially tough on teams that are stuck with them. • Yes, the salary cap will keep rising. We all get that. That helps in some cases, especially if a player’s production is likely to stay flat or increase, but it isn’t a blanket excuse for giving out ridiculous long-term deals. • We won’t penalize or reward teams based on whether they have any compliance buyouts left, though I did note a few cases where it’s pretty clear that one could be used. If the best defense of a contract is “Well, they can always just buy it out,” then it’s a bad contract. • Unofficially retired players like Chris Pronger and Marc Savard who are on the long-term injured reserve list aren’t considered bad contracts, since their teams are getting cap relief. • We’re worrying only about contracts that are currently on the books, not extensions that have been signed but have not yet kicked in. You’re off the hook for now, Corey Crawford and Henrik Lundqvist. And remember, this is a snapshot of the league’s worst deals right now. For each contract below, “years” refers to how many seasons are left (including this current one), not how many were on the original deal. You may be expecting to see some of these guys on the list, but they didn’t make the cut. Here’s why. Ryan Suter and/or Zach Parise, Minnesota Wild: Both their deals are obviously ludicrous. But hockey is increasingly becoming a sport where it’s worth paying big money for elite talent, even if you have to skimp everywhere else to do it. Are these guys elite? Suter seems to be. Parise … check back with me next year. Shea Weber, Nashville Predators: He probably has the most ridiculous contract in the league, but if the Predators decided to trade him, their phone would be ringing off the hook. Travis Zajac, New Jersey Devils: I really want to hate his eight-year contract. But Devils fans seem fine with the deal — even oddly happy with it. I still reserve the right to say “I told you so,” but for now, I’ll leave him alone. Ondrej Pavelec, Winnipeg Jets: I’m not a big fan of his work, and $3.9 million is too much for what he brings to the table. But as far as goalie deals go, this one is practically reasonable. Ryan Malone, Tampa Bay Lightning: Thankfully, just two years left. Roman Josi, Nashville Predators: This was a weird deal, and it probably set the record for most years given to a player you’d never heard of, but you could defend it. Brian Campbell, Florida Panthers: A few years ago it probably makes the list, but his deal expires in 2016, and Campbell’s actually been pretty darn good this year. Tyler Bozak, Toronto Maple Leafs: I didn’t like the deal at the time and I still think Mikhail Grabovski is better, but Bozak’s been earning his money this year. Tuomo Ruutu, Carolina Hurricanes: To be honest, I already felt like I was being too hard on the Hurricanes. Uh, spoiler alert. Any Member of the Philadelphia Flyers: I know, I was as shocked as you are. But while the Flyers have lots of bad deals — Mark Streit, Luke Schenn, Scott Hartnell — none are bad enough to make the top 15. And by the way, despite an off year, I’m not convinced the upcoming Claude Giroux extension was a mistake. Hossa is a great player, and he’s a steal at a cap hit just north of $5 million. So how can his contract be considered bad? Simple: It goes on forever. Well, not quite forever. Just until 2021, at which point, Hossa will be 42 years old. Hossa’s deal was one of the most egregious examples of the blatant cap circumvention deals that swept the league toward the end of the old collective bargaining agreement. It wasn’t even especially subtle — Hossa makes $7.9 million a season in real dollars until 2016, then sees his pay plummet to an eventual $1 million over the last four years of the contract. That’s some serious front-loading. If he retires in 2016, the Hawks will take a cap recapture hit of $3.6 million a season for five years. The Blackhawks signed Hossa in 2009 and went on to win two Cups with him (and counting), so it’s hard to imagine they regret this deal. But it’s going to look bad within a few years and stay that way for a long time. It is absolutely baffling that for the first time in recent history, there are no Calgary Flames in this list. Pavelec absolutely needs to be on that list. It doesn't matter that he's a goalie. What matters is he is terrible. Not to mention he was not really that great when he signed it. Most people were baffled and most people still are. Anyway, always great stuff. I almost never say this but your articles are a treat to read. "That should at least make the inevitable buyout easier to swallow." Not sure there's any swallowing to be had with Leino. While he's been awful, his signing didn't prevent the team from signing anyone else and we're talking Pegula money. He just spent $102m on a hockey rink at PSU and $170m+ on HarborCenter. He might literally have $18m in his pocket this very second. 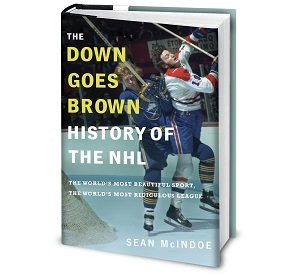 I miss the Old downgoesbrown. marty mcsorley/kerry fraser/wendel clark sightings are so rare since he's gone to grantland. I hope you bet your kids college funds on your Subban contract prediction because you nailed it. Spot on.